This past year in Las Vegas the pricing for residential real estate has deeply been discounted. Many developers have lowered their prices to levels of at or below their cost. At this pace many builders are going bankrupt or out of business. Manhattan West condos are going through the same lowered price expectations from buyers and Gemstone can’t financially keep up with the price downtown for the $350 million development. There is also less demand for condominiums for sale. A big drop in tourism, many casino layoffs and negative population growth are more reasons the project is halting. Vantage Lofts and Mira Villa have stopped construction and filed for bankruptcy. Manhattan West is comprised of 12 buildings and a total of 700 units. The main focal point of the residential real estate is a nine story tower that would include underground parking, 150,000 square feet of office space and 50,000 square feet of retail. Previous general contractor, Apco Construction, had to rebuild certain parts of condos because of improper construction. Extra time and fee incurred by Gemstone have led higher than normal costs. Existing buyers are still under contract while ways to complete it are sought. Future condo sales have closed, too. 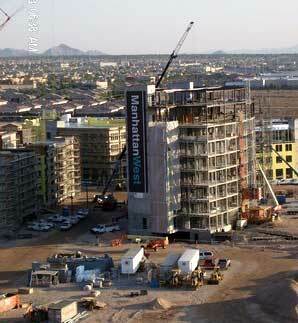 Manhattan West Las Vegas condos stopped construction on development.